1. 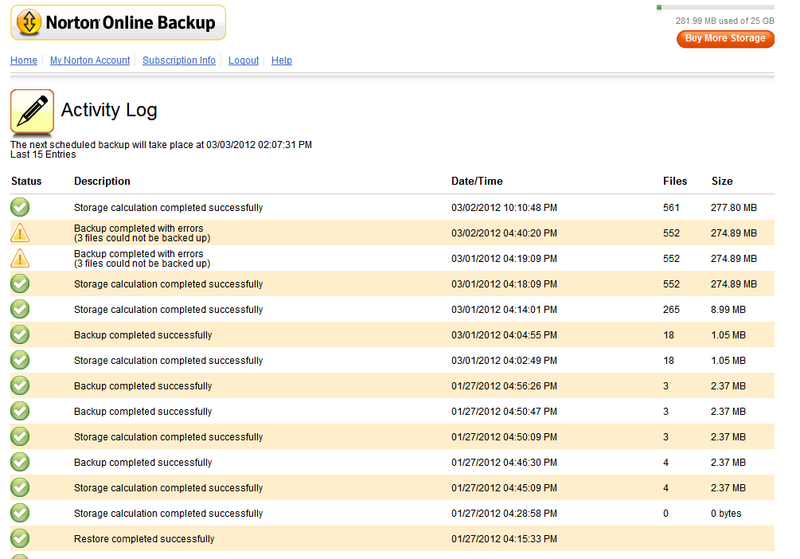 A backup was completed with errors as seen in Pic1. There was no indication of what files failed to backup. 2. As seen in Pic 2, one of the log entries became a hyperlink, which I'm assuming would have shown me the failed files. "Nobu is sorry something went wrong and will look at it right away. Click here to go back to the beginning. 3.When I clicked to go back the hyperlink disappeared and it looked like Pic1 again. I'm still waiting on a reply. This is a recurring issue and I really would like to know what files are failing to backup. I am also very interested in a reply to this issue as well. I am encountering the exact same issue where Norton Online Backup reports 40 files not backed up, but I am not able to click on the link to see what the 40 files are. This has occurred 15 days in a row. Hoping that someone will reply with a solution on how to identify the files not backed up. I have the same issue. The log file contains no useful trouble shooting information. I suspect a 2 to 4 MB compacted, encrypted file. I cannot evaluate this theory because Norton offers no technical information concerning maximum file sizes or any other critical properties of my data-set . I could omit it and the job might run but it does not solve the problem. A Norton technician replied (below) when I contacted them on the chat line. ; Taking control of your machine for trouble shooting is a fine thing, but it would take 3+ hours of D.S.L connect time to complete a 5 GB upload so I've been putting it off. I am really pleased to see some other users experiencing this problem. I am beginning to suspect that the 'N O B U' Cloud, while cheaper by a factor of 10; is not a professional; solution for business use. Hello Adrian, Thank you for contacting Norton support. I apologize as you receive an error message from your Norton Online Backup program. This issue needs deep analysis and research to find out the exact cause. So we cannot proceed further through email as we require taking remote access of your computer to manually check the settings. Now, please get in touch with our Chat or Phone support team, where one of our technicians, who with your permission securely connect to your computer then manually check the settings and help you to resolve the issue. Link to contact Online Chat support: http://www.norton.com/chat4help Note: Chat support is accessible 24 hours a day and 7 days a week. To talk to us, simply dial: 1-800-745-6034 [Toll Free Number]. I really appreciate your understanding in this regard. Please feel free to contact us if you have any questions. We will be ready to help you. "I suspect a 2 to 4 MB compacted, encrypted file"
- i agree with this because NOBU cannot perform backup of any file or folder if they are already encrypted.We must decrypt the source before taking its backup. - You can try encrypting a certain file of yours Mitka and perform a backup then check the logs,then see if you got the same "error message".If you get this result then you might try locating those files and decrypt it ^^.